Singing this with a few hundred strangers & a handful of friends in Sherborne Abbey this afternoon is an experience not to be forgotten in a hurry. We were remembering the life of a truly inspirational woman, Annie Sinnott who passed away in April this year. One of her staff from The Old Vicarage in Leigh, Dorset had re written the words and for many of us it was hard to keep away the tears as gentleman from all backgrounds whistled this familiar tune during the chorus. Annie and her Old Vic team were awarded many awards for the outstanding care they provided and she received an MBE in 2007. My mum, who was a district nurse, had worked with Annie, then a midwife, in the 1970s and on the opening of their residential home Annie offered me one of my first weekend and holiday jobs as a care assistant. On my first day, aged 15, I was being shown the ropes by sisters, Stella & Madge. Annie, always rushing off somewhere, had to pop out. Whilst helping a resident upstairs, Stella realised that lunch had to be got going, and as Annie was out, and Stella ‘didn’t do ‘ lunch, it was therefore my job to put the broccoli ‘on’. I’m ashamed to say that at 15, I still had not yet cooked broccoli and so I put enough of the vegetables for the 7 residents and three staff into the large saucepan and turned the electric ring on the cooker to full. went upstairs, not entirely confident that I had done it right. Needless to say, the smoke alarms soon went off and Stella was made aware of just how hopeless teenagers those days were as I’d neglected to put any water in the pan! This is the kind of thing that would be the end of the world, or at least employment, but with Annie it meant a hearty laugh and then special attention over the following weeks as she passed on some of her extensive cooking expertise to me. For a vibrant woman, so very full of life, to be taken suddenly has been a huge shock for everyone whose lives she touched. Moving accounts from friends and her daughter’s reinforced what we all knew about this busy Angel. She always saw the best in everyone and encouraged us all to be the best we could be. Often pushing people beyond their comfort zones but watching them blossom afterwards. Her wicked sense of humour included sending a card to her teenage god daughter with ‘pregnancy results’ on the envelope. I also remember her returning from a supermarket shopping trip with her good friend Wendy, both in fits of giggles as they’d been popping ladies sanitary ware into lone gentleman shoppers trolleys. Two weeks before she passed she was having lunch with long term friend & fellow teenage employer Nicky. It was the day of an official assessment of the home but she’d set it up running so smoothly that she knew she didn’t have to be there. That is her legacy, hundreds of people who she trained, many still working in Leigh, achieving the best they can, always what Annie knew they could. When I left for Art school, Annie bought several of my paintings, one of which was an ‘O’level exam piece I’d had framed and still hangs in the Old Vic corridors. When I became professional she commissioned a painting ‘Annie’s Jug’ and even invested as a share holder when I set up my business. Always positive and always supportive, yet as her daughter said ‘always on a diet’. Annie was the best hostess, regularly hosting dinner parties and lived with an open door policy. I learned today that when her & Ian were first married, they had a ‘crash pad’ in Bristol where they welcomed travelers to stay during their travels. Always a full house & always guests leaving with full stomachs. Generosity in spirit , time and over flowing with thoughtfulness. She is sorely missed, but as the Abbey was filled with splashes of bright pink, and giggles as we realised we all shared the same memories of this incredible woman. She had no ‘sides’. What we saw is what we got, love , encouragement and food in boundless quantities. I can’t imagine that she is now ‘resting’ but in a place where diets don’t matter and every day is filled with recipe books and laughter! 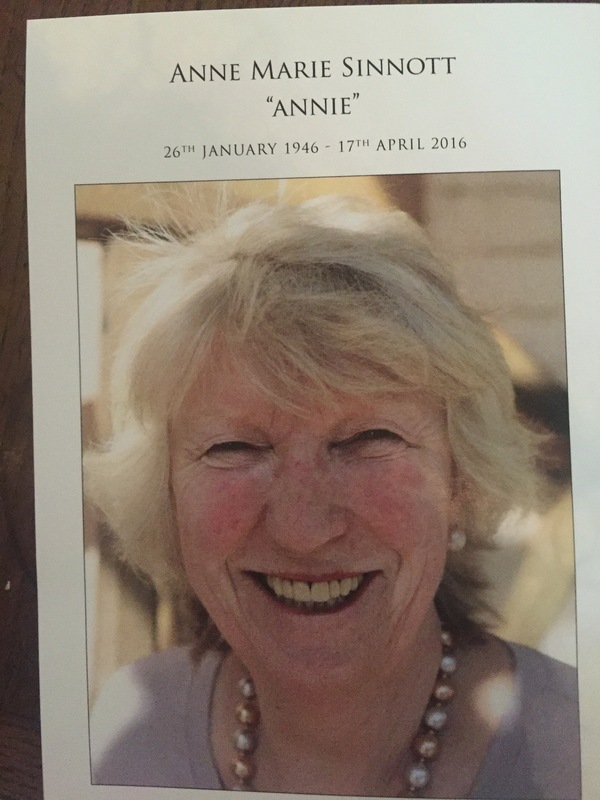 Thank you Annie, you’ve been a tremendous influence in my life and I certainly shall never forget you. Paula, thank you writing and posting this inspirational tribute to an outstanding woman.